All motorheads should take a trip to the Bonneville Salt Flats at least once in their lives to see the best mechanical circus on wheels. Each summer, professional and amateur teams from around the world compete for land speed records in different vehicle classes. Located at 114 degrees west longitude and 40 degrees, 45 minutes north latitude, or along Interstate 80 near the Utah/Nevada border. There are three time-trial events each year conducted by two sanctioning bodies, the Southern California Timing Association/Bonneville Nationals, Inc. (SCTA/BNI) and the Utah Salt Flats Racing Association (USFRA). 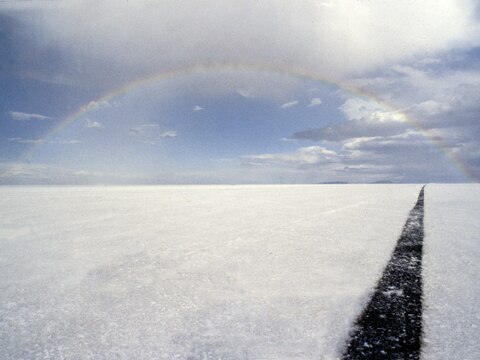 The Salt Flats expanse covers 30,000 acres (nearly 47 square miles) and lies 4218 feet above sea level. The federally owned land is operated by the Bureau of Land Management (BLM) Salt Lake field office. Decades of land speed racing put Bonneville on the National Register of Historic Landmarks. The 99 million cubic yards of salt crust is almost five feet thick in the center, tapering off to less than one inch at the edge. It is nearly all table salt. Formed during the last ice age, Lake Bonneville covered nearly two-thirds of Utah and was almost 1000 feet deep where the Flats are today. Racers formed “Save the Salt” to protect Bonneville from harm, mainly from mining operations that extract up to 850,000 tons of salt from the flats each year. Working with the BLM, USFRA, SCTA/BNI, and mining officials, the group now returns 1.5 million tons a year. There’s no shade or seating, so bring your own and make sure you cover the salt where you are sitting, or you’ll cook from the bottom up. Heat stroke is a real danger if you ignore personal protection. Wide-brimmed hats, dark sunglasses, light-colored clothes, SPF 50 sunscreen, salty snacks, fruit, and a couple of liters of water per person are essential, because afternoon temperatures can hit 114 degrees Fahrenheit and feel like 125 degrees. The humidity can dip to seven percent. Those who are sun-sensitive should wear long sleeves and loose-fitting clothing. On KSALT (1610 AM), radio salt jockey Ron Christensen calls the action to your earbuds. Fly into Salt Lake City, rent a ride (but don’t even think of driving your rental on the salt), and head west on Interstate 80 for 120 miles to Wendover. Only a couple miles from the salt, Wendover is a half-and-half city situated on the Nevada/Utah state line with both casino-based and pious accommodations. In 1914, “Terrible” Teddy Tetzlaff drove the Blitzen Benz to a world record speed, besting the 142-mph record, but the feat was unofficial due to paperwork and politics. Ab Jenkins drove solo for 24 hours, averaging 112 mph in 1932, only to be snubbed for the same reason. The salt charm came when Sir Malcolm Campbell brought, at Jenkins’s urging, the gargantuan Blue Bird-and proper officials-to nail the first plus-three (more than 300 mph) record at 301.1 mph in September 1935. Speedsters have been coming to Bonneville ever since. Spectators watch two courses laid out in a V shape from the starting line. The short course has one timed mile for vehicles running less than 175 mph, and the long course has three timed miles for everything faster than 175 mph. Only one vehicle at a time is allowed to run on each course. Land speed entrants run against open or existing records daily. Any run in excess of the record qualifies the vehicle for “impound.” The next morning, all qualified impound vehicles race across their respective courses before any other vehicles. If the average of two runs exceeds the current record and the vehicle passes inspection, a new record is registered. There are dozens of classes, but streamliners and lakesters are unique to the sport. Roadsters started it all, but now you can also see semi-tractors; 36-hp VW Beetles; diesel, electric, and even hydrogen-powered cars, bikes, and trucks. Spectators are allowed on the starting line, along the staging lines, and in the pits. You can walk, but not drive vehicles, through the 2.5-mile-long pits. Golf carts, bicycles, and motorized bar stools are allowed.